At the version 2, we had 1200 compounds database to build properties estimations. Now we have more than 10000 compounds. When building V3, at first we examined functional groups. The new compounds may need define new functional groups. Sometimes, there are too little physical data and erase that functional group. If we have new properties database, we can easily expand our system. So, please let us know if you want to know other properties. Once we build properties estimation scheme, we can search molecules from our large database. 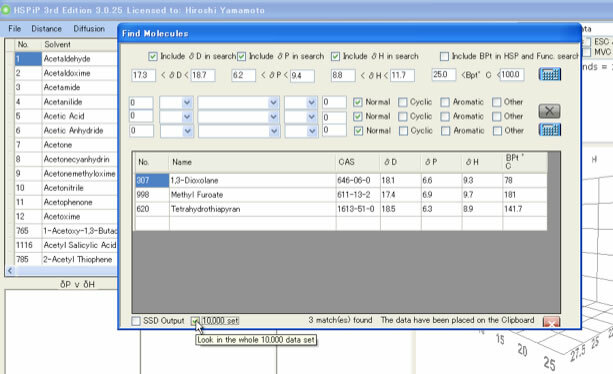 In HSPiP ver.3, pre-calculated HSP values and other properties are available. 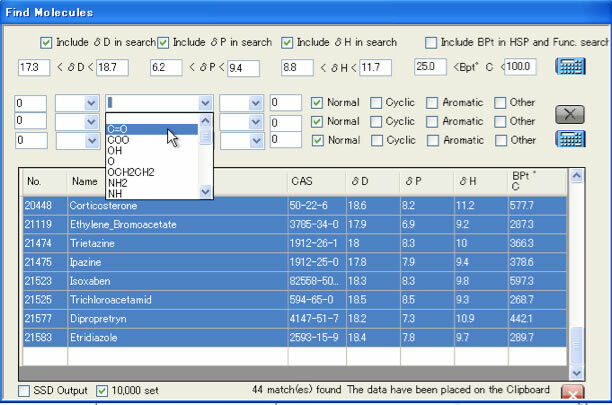 For example, you can use Find Molecules menu. If I enter HSP range l used Allergens, in the basic database (Ver.2) we get only 3 compounds, but If you check 10,000 set option(Ver. 3), you get 44 match. You can use other Find Molecules options. You can set Boiling point range or you can set functional groups range. This function is very easy to use when you want to search liquids-liquids extraction solvents, search certain polymer solvents or search solvents for organic synthesis. 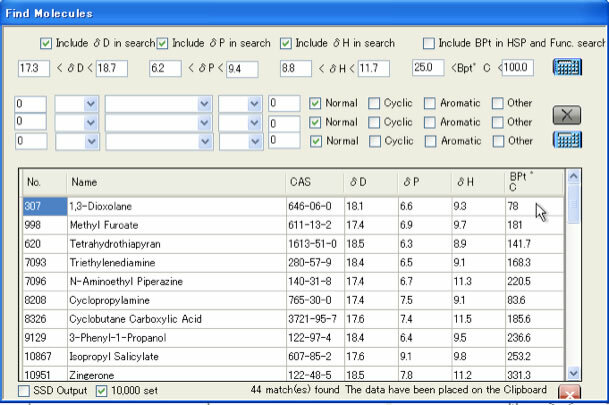 This database and Find Molecules is the most powerful tool in ver. 3.